Engadget writes about a new LCD-backlit TV from LG.Philips, first discovered by AVing. 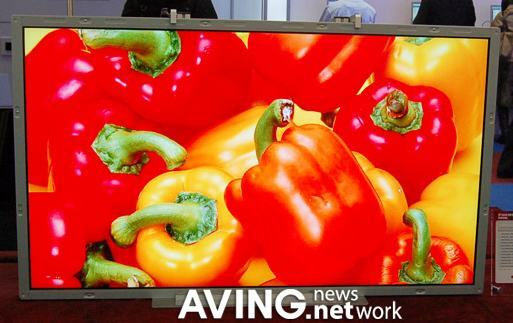 LG.Philips presented 47", 26", 15.4", 12.1", 8" and 7" LED backlit LCD panels. The 47" version features Full HD 1920 x 1080 and has a mega contrast ratio of 1,000,000:1! And just like we heard, this panel brings a Full HD 1920 x 1080 resolution and a "Mega CS" 1,000,000:1 contrast ratio for truly black, black-levels obtained though a process of local dimming. It's listed with a 500cd/m2 brightness, 178-degree viewing angle, 8-ms response, and 1.07 billion colors covering 105% of the NTSC color gamut. No word on release so we'll have to cling to the original "as early as Q2" hearsay for now. Meanwhile, the 26-inch panel brings a 1366 x 728 pixel resolution, 540cd/m2 brightness, 18,000:1 contrast ratio, 178-degree viewing angle, and covers a hot 136% of the NTSC color gamut. The 15.4-inch and 12.1-inch LED-backlit LCDs are destined for laptops. The 15.4-inch panel matches the equivalent LED-backlit Samsung panel spec-for-spec only it comes in a bit dimmer at 300cd/m2 vs. Sammy's 330cd/m2. The 12.1-inch panel measures just 3.15-mm thin yet packs a respectable 1280 x 800 resolution, 400:1 contrast, 250cd/m2 brightness, and 16-ms response.